I’m planning to launch an accessories retail shop. I will almost certainly do this online, but I wanted to know exactly what overheads I’ll save compared to a bricks and mortar store. Generally, are the savings extremely high? What kind of overheads do you cut down on by having an online store? It's a great question. It's certainly much cheaper to launch an online retail store compared with a physical store, and there are significant cost savings to be made. That said, there are also some significant disadvantages to operating an online only store. So it's worth looking at both the pros and cons. The annual rent you'll pay can vary significantly depending on your target customer and the type of store you're looking to open. We were recently looking at Oxford St. in Paddington, Sydney as a potential location for a Shoes of Prey retail store and rents there can get as high as $150,000 per year for a 70 m2 store. A good location in the major mall of a capital city will be much higher than that, as will a store in a premium Westfield centre. Australia has some of the highest retail rents in the world with Sydney ranking second highest in the world for retail rents and Brisbane and Melbourne are not far behind. By operating online you'll avoid paying rent which is a major cost saving. Unless by some incredible coincidence the previous tenant had fit out the store in a way that exactly suits your brand, you're going to need to spend some money to fit out a physical store if you lease one. We received a quote for moving some walls, redoing a floor, painting, fitting out an alarm system, replacing the air-conditioning and some other works to a store we were looking at in Paddington Sydney. We were quoted $120,000. That didn't include shelving, fixtures and fittings which would have cost extra on top of this price. To keep a store fresh it will need to be re-fit out every 5 years or so and requirements to re-fit out stores are usually written into leases at major shopping centres. A physical retail store needs to staffed whenever it's open. If your store is going to operate 7 days a week and average 10 hours open per day you're going to need 2 full time staff just to keep the doors open, and more if you want to have 2 or even 3 people in the store during busy periods. Depending on the quality of the staff you want to hire, you're looking at least $100,000 a year in staffing costs. You'll need people to run the customer service for your online retail store, so you're not getting out of this cost completely, but if you launch with email only customer support as we did it's much more flexible in terms of staffing. As you grow and hire staff you can add phone and chat support as we've done at Shoes of Prey, but you can get away with much lower staffing at launch to keep your costs down. 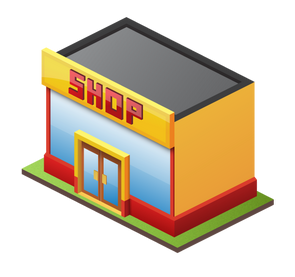 There are a whole range of smaller costs that you'll incur opening a physical retail store. Many of these you'll also incur with an online store but they will generally be lower. You don't need expensive to run down lights to light up your store, insurance for a small warehouse is generally much cheaper than a retail store and you can get away with a Skype In number instead of a phone line for phone calls. If you add all that up there are certainly some significant cost savings in opening an online store compared with a physical retail stores. While there are some significant cost savings in opening an online only retail store, there are also some significant disadvantages which need to be weighed up against the benefits. Like rent, the cost for doing this can vary significantly. To start out you can try an off the shelf system like Shopify that makes it really simple to put together a high quality online store without a great deal of technical knowledge. Hire a designer to put together the graphics and you potentially have a good online store for under $5,000, plus a percentage of your sales ongoing depending on which Shopify plan you go with. At the other end of the scale you might want to do something unique and different like we did with Shoes of Prey. One of our co-founders Mike Knapp is an ex-Google software engineer so he built the site in house, but the value of the time he's put into the site would be worth many $100,000's. To get to launch would have cost us around $80,000 in Mike's time so that was still cheaper than if we'd launched our business with a physical retail store. Most online retail businesses will need to warehouse the stock they're selling. The size of the stock will determine how expensive warehousing is going to be for you. Most online retailers I speak to, us included, used the founders living rooms as warehouses when starting out, so the cost here is more your sanity than a physical cost. As you grow though you'll need to look into warehousing. There are third party providers who will manage the warehousing of your stock for you, or at the other end of the scale you can set up a multi-million dollar facility as DealsDirect have done in Australia. If you're selling online you're going to need to ship your goods to customers. You'll need to work with a local company such as Australia Post (which has it's challenges) or a local courier service. We're a more unique case at Shoes of Prey because our products are mostly made to order. We use DHL to ship our shoes directly from our office in China. Traffic - A physical retail store in a good location provides great foot traffic and customers to your store. Just by being there you'll hopefully be selling product. A poorly marketed online store might sit there with very few visitors. If there's nothing to differentiate your online retail store it can be an uphill battle getting visitors to your website. That said, if you have a unique proposition you can bring a lot of people into an online retail store. Back in March we had a record day with 197,000 people visiting our site. Good luck fitting that many people into a physical retail store! More than 2/3 of our traffic and 60% of our sales come from people outside Australia. We'd need a massive network of stores to achieve this offline. Conversion Rate - It varies greatly depending on the product but a good physical retail store should make a sale to around 20% of customers who enter the store. An average Australian online retail site will sell to 1% of visitors to the site. Our conversion rate at Shoes of Prey is much less than that. There are a number of reasons for this, it's certainly much easier to visit an online retail store than a physical retail store, but there are also issues around not being able to see and touch a product. This is a significant issue for us selling women's shoes online as shoes are something most people would ideally like to try on before they buy them. We try to counter this with great photography and educational videos on our site, but until technologies improve significantly online retail stores will continue to have much lower conversion rates than their physical counterparts. There are some significant cost savings in opening an online retail store compared with a physical retail store, but there are also some potential disadvantages as well. We're clearly strong proponents of online retailing at Shoes of Prey but you need to ensure you have a unique offer and a strong point of difference from your competitors to succeed in the space. Michael, again very educational post :). One key issue/unknown variable before starting up an online store many people face, including me, would be the ideal combination of warehousing and shipping and where your inventory comes from. The ideal situation would be that the product you sell, gets shipped directly from the place you buy it from (as a reseller) or make it that, thus eliminating your warehouse cost + your own time spend on doing the actual shipping and stocking. Do you have any thoughts on this? 1. Where is your target market based? If it's worldwide perhaps you warehouse and ship from a place near where the product is made. If your target market is Australia it might make more sense to warehouse and ship from Australia so customers get their goods faster. 3. How much control do you need over the final product? In our case our shoes are made to order and we ship directly from China to the customer however we still have all the shoes go through our office in China so we can take care of quality control, photographing the shoes and packaging. We have a team of 2 with a 3rd starting on Monday who take care of these processes from our office in China. We wouldn't want to pass these tasks on to our supplier because we think these steps are critical to our customers having a great experience with us. The risk of being a reseller and drop shipping is that there will be little to nothing to differentiate what you're selling from other suppliers, so you'll likely have to compete on price = smaller margins. There are 2 other major differences for me...the fact that your online store is open 24/7 and at the convenience of your customers and also that you have a more versatile business model as an online outlet. Your nimbleness and ability to react or generate trends in the market place is worth a ridiculous amount. Over the counter transactions for many items are falling the way of the printed newspaper. They'll always exist, but they wont forever be the majority. Both are great advantages, agreed.